Our software allows you to create a new database from scratch, from an existing template, or from an Excel import. When creating a database take some time to give the database a name and set up the preferences. Under the Attachments area, choose whether you want comments, files and discussions, or tasks to be associated with your database records. If you're not sure about an option, click Next and decide on it later. You can return to Database Preferences at any time. 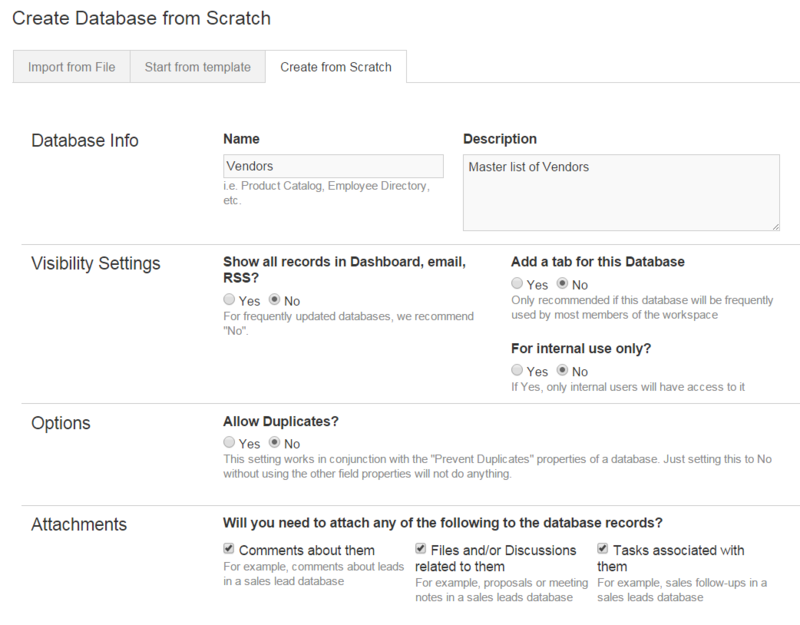 To create a new database from scratch, navigate to the Database tab and select New Database > Create from Scratch. Once you have selected your database preferences, click Next to move on to the field creation screen. Now that you have data fields, you'll want to add data to them in the form of records. Click on the New Record button in any Database View to create a new record. You can also add an Add Record Form Application block in a wiki or add a Web Capture Form to a outside website and have the form data syndicate directly a database. You can view your records using the Standard View or you can customize a database view to display filtered results. 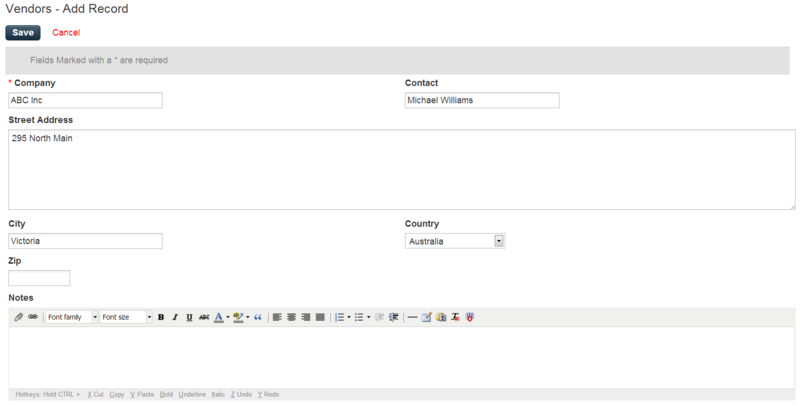 You can also place a Database View Application Block in a wiki to display your database views. You can also edit the records within a database. To do so click on the pencil icon to edit all fields of the record. If you want to change only one field of a database, you can also click-to-edit to do so. Note: When editing a database record, users who are subscribed to that particular record will be notified via email of any changes that occurred. Subscriptions to a record can be configured within the record by clicking the Share drop down menu button in the upper right hand corner, and selecting Subscribers. If you have an existing database, you can export it in a CSV format. This feature allows you to backup your data or use it as a template for a new database. To access this feature, navigate to a database and click Options > Export to CSV under the Database Actions heading. The exported file will be emailed to you when the CSV export is ready. You can also choose to export the just current database view by selecting Options > Export to CSV from the View Actions heading.